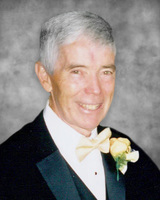 Peacefully on Sunday, April 14, 2019, Alex McFedries, loving husband and father, passed away at the age of 79. Alex was born on January 20, 1940, in Ayr, Scotland, coming to Canada at the age of 17. He is survived by his wife, Carolyn, daughter Meaghan (Cameron), and grandchildren Madelaine and Charlie. Survived by his older brother Jim. Pre-deceased by parents, Esther and Alex, and brother John. Alex will be fondly remembered by his nieces, nephews, family, and friends. Alex proudly served as the Assistant Clerk in the Legislative Assembly of Ontario between 1971 - 1997. After which he could be found in his cherished Jaguar, travelling to and from the Board of Trade Golf and Country Club. His social spirit, love for family and friends, and steadfast commitment to the rules of golf will live on in those who were touched by his full life. Friends will be received at the Ward Funeral Home 2035 Weston Road (north of Lawrence Ave) Weston, on Monday April 22, 2019 from 12noon until the time of the funeral service in the chapel at 1pm. Cremation has taken place. As expressions of sympathy, donations to the Alzheimer’s Society would be greatly appreciated. Consider providing a gift of comfort for the family of Alex McFedries by sending flowers. I remember when I was a young boy, Great Uncle Alex would shake my hand when saying hello and goodbye. He was the first relative to greet me this way, and I loved it. I loved the fact that he treated me older than my age. It made me feel respected, mature, and confident. I will miss his humour, his wit, and his charm. He was my Great Uncle, and he lived up to the title. Rest peacefully.